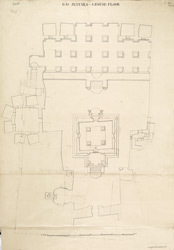 Ground floor plan of Dasavatara Cave, Cave XV, at Ellora from James Burgess' 'Original Drawings [of] Elura Cave Temples Buddhist and Brahmanical.' The spectacular site of Ellora, in Maharashtra, is famous for its series of Buddhist, Hindu and Jain cave temples excavated into the rocky façade of a cliff of basalt. The works were done under the patronage of the Kalachuri, the Chalukya and the Rashtrakuta dynasties between the sixth and the ninth centuries. The Dashavatara Cave was started as a Buddhist monastery, but in the eight century was converted into a Hindu sanctuary under the patronage of the Rashtrakuta king Dantidurga (r.c.730-55). It consists of an open court with a free-standing monolithic mandapa in the middle and a two-storeyed hall at the back, the original Buddhist monastery, the walls of which are covered with reliefs illustrating Hindu mythology. The columns are decorated with elaborate pot and foliage motifs carved on the shafts.